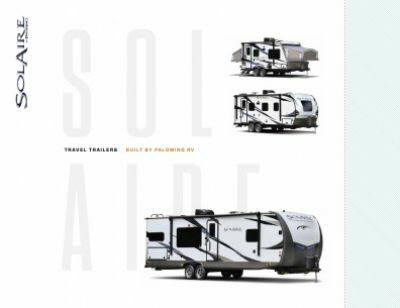 Start planning your camping adventures with the 2019 Palomino SolAire Ultra Lite 205SS Travel Trailer! National RV Detroit, located in Belleville, Michigan, has been one of the top full-service RV dealerships in Michigan and the entire country since 2008! That's because we offer all the top brand RVs - toy haulers, travel trailers, 5th wheels, motorhomes, hybrids, and more - at wholesale prices! We have a great selection and a nationwide best price guarantee, so you'll find the RV of your dreams and get a deal that you'll love! Stop in and see us at 44700 N I 94 Service Dr Belleville Michigan 48111, and let our friendly, knowledgeable staff help you select the perfect RV for your family! We deliver anywhere in North America, so even if you don't live in the Belleville area, you can still go online, check out our huge inventory, and then call us at 734-439-3400. With our fast, reliable, 24/7 delivery, your dream RV will be at your door in no time! And you'll save $1000s! This 2019 Palomino SolAire Ultra Lite 205SS is built to hit the road and go! It has a hitch weight of 546 lbs. and a GVWR of 5630 lbs. Once you're at the campsite, the easy to open 12' 0" patio awning will provide shade and protection for outdoor lounging! Eating out can be an expensive habit when you're on the road. Thanks to the great kitchen in this RV, you won't have to settle for high-calorie, non-nutritious fast food! The 3 burner range cooktop will let you whip up delicious, healthy meals, while the 8.00 cu. ft. refrigerator can stock fresh fruits and vegetables, as well as your favorite juices and other beverages! You'll be able to clean, drink, and cook with plenty of water from the 50 gallon freshwater tank! After a full day of outdoor fun, a hot shower makes you feel clean and refreshed. In the Palomino SolAire Ultra Lite 205SS, you can enjoy the comfort and privacy of a beautiful master bathroom with its roomy shower and convenient Foot Flush toilet, and never trek to the damp, cold campground communal bath! The 50 gallon freshwater tank and 40 lbs. of LP tank capacity mean lots of hot water for the whole family! Dirty water and waste are stored in the 38 gallon gray water tank and the 30 gallon black water tank, respectively.